Why your workplace should smell good. Sure you’ve been inside a fast food shop that has blown you away with how bad it smells. You’ve also probably walked into a store and thought ‘wow, this place smells REALLY good’. Now, which store, as a customer is more likely to get your business? Well, if you have a working set of nostrils, the shop that smells better is the more attractive option. Your senses really don’t lie. This is so obvious – yet so many organizations get it wrong. A warm and inviting smell draws in the customers, whereas an odour or even a harsh perfume pushes potential customers away. Think like a customer when deciding what you want your workplace to smell like – alluring, or dark and unpleasant. NFL Superstar Deion Sanders once said “If you look good, you feel good. If you feel good, you play good”. This could not be truer when applied to employee morale. If certain areas of your workplace smell bad, employees are likely to avoid them. An employee’s negative behaviour or attitude can easily rub off on a fellow employee or customer. It is so important as an employer or supervisor to make your employees feel comfortable, and happy when they are at work, to create a positive atmosphere in your workspace. Odours can be the offspring of airborne diseases. Many air fresheners simply mask the odour – not eliminating it. This leads to the odour coming back stronger and angrier once the mask wears off. Luckily, at Envirocare Systems – we have just the solution for pesky odour problems, introducing the OXY-GEN air freshener. and is 100% environmentally friendly. 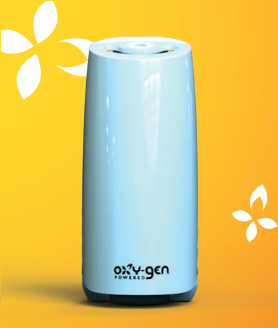 The OXY-Gen Air Freshener produces continuous levels of intense fragrance that contains no propellants, solvents of CFC’s. It has no complicated settings, and is available directly from us at Envirocare Systems on a ‘set and forget’ plan. Our crew will seamlessly maintain your OXY-Gen air freshener, providing you with a range of aromatic scents, whilst ensuring your fragrance never runs out! Keen to wow your customers with an affordable, efficient air freshener? We can help, contact us today.